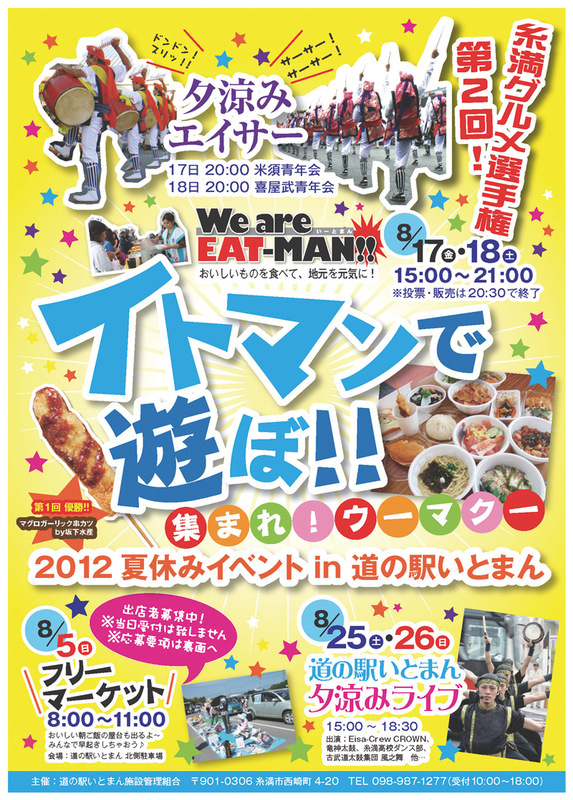 The 2nd Kuebu Festival is coming up Friday and Saturday at the Road Station Itoman, but most people know the event as the Eat-Man Gourmet Festival and Contest. The two-day Eat-Man festival centers on promoting food and ingredients made in Itoman, with Itoman-based companies that produce the cuisine or gourmet recipes are well in evidence. Kuebu means “lucky eater” in the Okinawan dialect, and organizers are dedicated to running a food-oriented event from 3 p.m. ~ 8:30 p.m. daily at the Road Station Itoman in Itoman City. The competition, or contest, is based on food. Every visitor becomes a judge by virtue of casting ballots by ticket. Visitors buy tickets for purchasing foods exhibited at the Kuebu Festival venue. 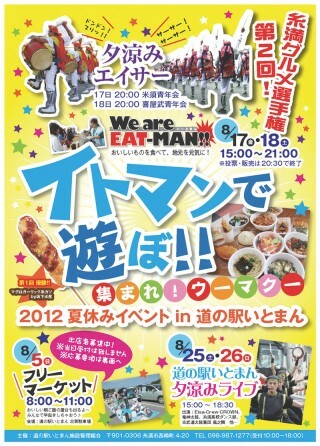 Tickets cost ¥1,000 each and are divided into ¥100 increments. Visitors choose the food they want, and pay with the same value in tickets. A vote paper is attached to each ¥1,000 ticket and the owner votes which is the favorite. The winner will be announced at 9 p.m. Saturday. The festival will feature performances by the Komesu Youth Eisa and also the Kyan Youth Eisa. Last year’s winner was the Tuna Cutlet Garlic on a Skewer by Sakashita Suisan of Itoman City. The tuna, incidentally, was also from Itoman fishermen. 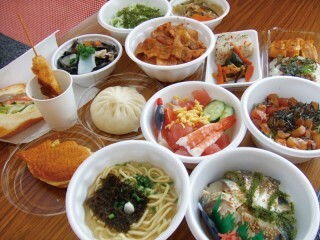 Other meals exhibited last year, all using Itoman ingredients, included the Bonito Rice Bowl with Hot Green Tea, Squid Ink Ramen, Carrot Gyoza, Seafood Champuru Bowl, Steamed Fish Paste Burger, and fish soups.